A dual shower head, also sometimes called a two-person shower head, is one of the most versatile types of shower heads you can choose for the bathroom. Especially helpful for families with young children or pets, the combination of fixed and handheld heads gives you options in the shower. We want to help you find the best dual shower head for your home and family, so this guide looks at five of the best units to help you narrow your options. We’ve done the research for you, so combining your preferences with our in-depth information should get you to the right one fast. For a luxurious shower experience, the AquaDance 7″ Premium High Pressure 3-way Rainfall Shower Combo may be the right choice, offering various rainfall settings in each head that you can use together or separately. 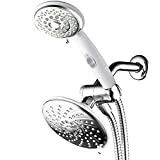 DreamSpa Ultra-Luxury 9″ Rainfall Shower Head/Handheld Combo has the look and feel of a unit you’d find in a pricey hotel but without a high price tag. Choose between the fixed rainfall head or the handheld head by pushing a button. 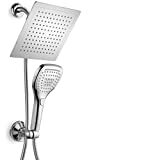 Ana Bath 5 Function Handheld Shower and Showerhead Combo has a simple look but its multiple water flow settings and perfect angles are customer favorites. 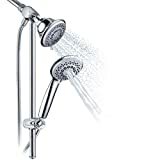 HotelSpa 30-Setting Ultra-Luxury 3 Way Rainfall Shower-Head/Handheld Shower Combo has a regular and a rainfall shower head to give you the best of both worlds and ultimate versatility for each shower. 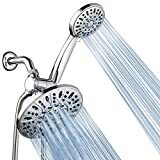 HotelSpa SpiralFlo 3-Way Shower Head/Handheld Showerhead Slide Bar Combo has a precision water flow design that pumps powerful sprays to give low water pressure homes a boost. Our dual shower head reviews include our five top picks for some of the best double units on today’s market in terms of performance, durability, and functionality. The AquaDance’s shiny chrome finish is not only eye-catching in the bathroom, but the smooth surface can also make it simple to keep these dual heads clean and buildup-free. The silicone jets also keep themselves relatively clean, so you won’t have to wipe them down after every use. With this unit, you can experience a rainfall shower from both heads at the same time, or use each one separately. Each head also has the same 6 settings, so you can mix and match your favorites to create a one-of-a-kind shower. One of the most significant benefits of this shower head unit is that it’s incredibly easy to install. You can use your hands to loosen and tighten connections, and the combo unit will fit on most standard shower head arms for a quick and straightforward upgrade. Customers commonly praise the handheld shower head, especially, for its excellent pressure, decent head size, and its durable, quality feel. 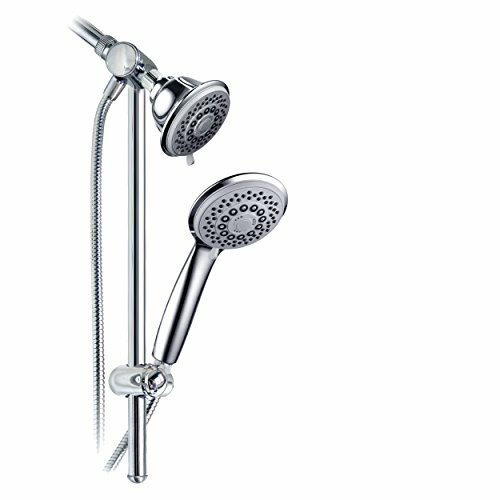 The DreamSpa Ultra-Luxury dual shower head combo is one that mimics the look and feel of a high-end spa shower. With its large, square, fixed rainfall head and shiny chrome finish, you can easily upgrade the look of your shower. This unit does fall short in versatility, since you can’t use both heads together and there are limited water flow settings. However, if a rainfall shower is what you’re after anyway, this could save you money on pricier units with extra settings you don’t need. 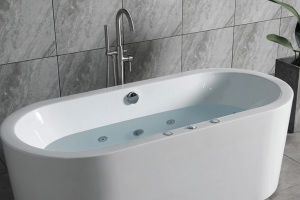 People who have bought and used this DreamSpa combo say that they enjoy the amount of water the fixed unit puts out, which gets them wet quickly and keeps them warm in the shower. 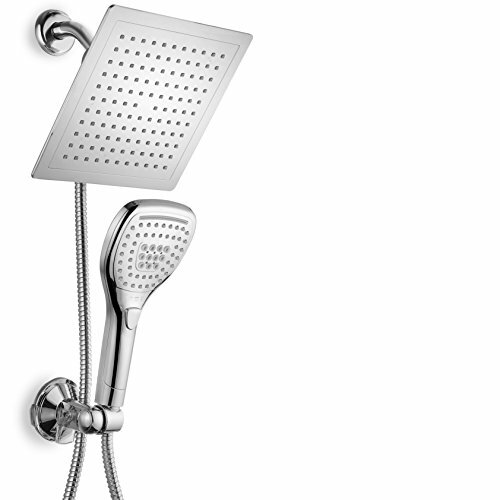 You won’t see a lot of frills with the Ana Bath dual shower head unit, but you will get a lot of functionality. This combo can use both shower heads at a time and you’ll get various water flow combinations by choose between five settings on each head. 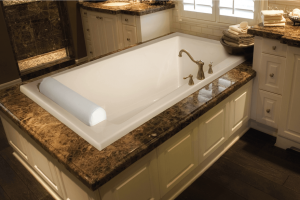 While its look is lackluster, the unit makes up for it in its easy-to-clean surface. The faces of each shower head are silicone, which is simple to wipe down to keep clean, and you can press on the silicone jets to release water and prevent buildup. Several customers appreciate how sturdy and durable this unit is for its price. One customer stated that the unit has exceeded the performance of much pricier ones they’ve purchased in the past. The HotelSpa rainfall shower head and handheld combo is a budget-friendly unit that gives you a lot of versatility for the price. When you combine the use of both heads together, you end up with 30 water flow combinations to find your maximum comfort. The unit includes a 6-inch rainfall fixed head and a 4-inch handheld head, offering a lot of water coverage. You can switch the handheld off with a slider switch, so there’s no annoying dials or knobs to turn. The HotelSpa’s hose can reach most areas of the shower, thanks to its length and flexibility. Households with pets and kids will likely appreciate this unit’s ability to move easily without getting tangled or being difficult to maneuver. This HotelSpa unit does seem to have some issues in homes with high water pressure. Some customers had problems with durability over time, so the unit may not be able to stand up to consistently high-pressure showers. HotelSpa’s SpiralFlo is a step up from the other dual shower head unit from HotelSpa on our list. This one has a combination of 36 water flow patterns between the two heads and silicone faces that can keep grime and hard water buildup from clogging the jets. This unit also has a slide bar that allows you to slide the handheld head up and down for ultimate comfort whether you’re short or tall. You can also rotate the heads to reach different angles in the shower. Customers say that this unit does feel lightweight and cheaper than some, but many are pleased with its performance. Most customers also like that it’s so easy to adjust and has a wide range of settings to get comfortable sprays for everyone. 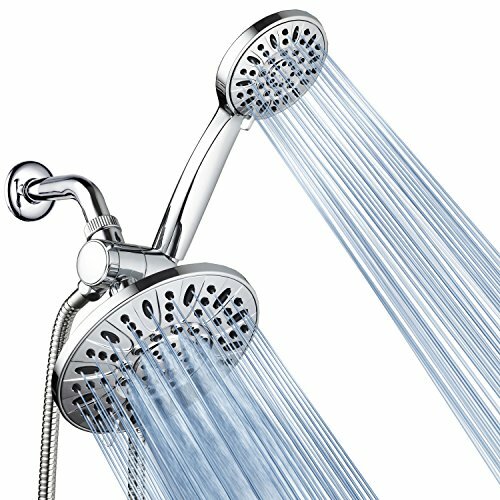 You want your new shower head to last a long time without leaks, rust, cracks, and anything else that could harm its performance. You also need one that has the functions you and your family wants. If you’re still not sure which of our top picks is right for you, check out the below information that can help lead you to the best choice. One of the best things about dual shower heads is that they can be versatile. Buying one with limited settings or versatility negates the benefits of owning one. 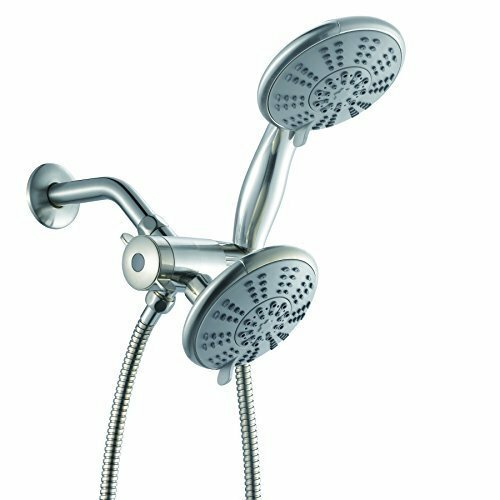 Some dual shower heads are designed for you to choose between using only one or both heads at the same time. This is a helpful option that can increase the unit’s versatility and functionality. 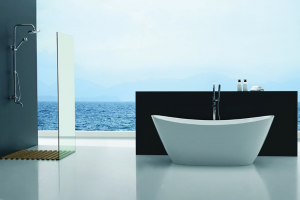 Some units also have multiple water settings combined with the previous feature, giving you numerous water flow combinations using one or both heads. This allows you to have ultimate control over your shower. Granted, finding a shower head that matches the overall décor of your bathroom is important. Most people appreciate matching fixtures in the bathroom but not all shower heads have multiple finishes to choose from. 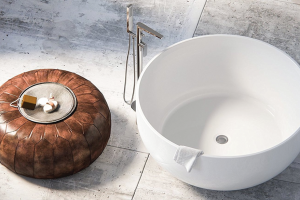 As crucial as a seamless design is to your bathroom, it’s more important to have a durable, high-performance shower head that will last not just for years, but decades. It can be easy to get caught up in falling in love with a finish, but if the finish is just a coating that masks a cheap shower head, you’ll end up needing a replacement much sooner than you hoped. Instead, look for shower heads made from a quality, durable material, like stainless-steel, instead of focusing on its design only. In some parts of the world, there are water conservation laws that limit the amount of water you can use daily. California, for example, is putting legislation in place to restrict the daily number of gallons a person can use each day. Dual shower heads do tend to use more water than single heads, which can affect your daily usage. Check local regulations before making a purchase. It’s always a good idea to look for a shower head with a water-saving feature or device that restricts water flow to conserve water. Even if your locality doesn’t have restrictions, this feature can save you money on your water bills. When it comes to choosing a quality shower head, you should want to put your money into a unit you can trust. Although sticking with brand names isn’t necessary for everything you buy, you should consider choosing a dual shower head unit with a reputable name if you want it to last. While researching, it’s common to find the same product under multiple brand names. It might seem like an excellent unit but being manufactured under various names is a red flag. Check to see if the product you’re interested in is one that has its own website or is sold by reputable home supply companies, like The Home Depot or Bed Bath and Beyond. Those in our guide are reputable shower head manufacturers. The AquaDance 7″ Premium High Pressure 3-way Rainfall Shower Combo is a budget-friendly dual unit that can likely meet the needs of most families. 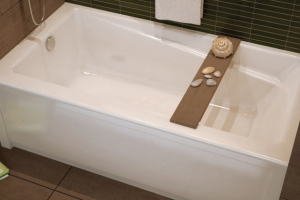 With each head offering a variety of water flow settings, you end up with 30 combinations of water patterns to make each household member and guest find their perfect settings. This unit also ranks highest on our list for its quality materials and long-lasting performance. It doesn’t feel lightweight and flimsy, but instead looks and feels like a high-end combination unit you’d expect to see in luxury hotels. The heads are easy to adjust where you need them and it’s simple to keep them clean, so the sprays continue to work like they did when you first used the unit. The AquaDance is our choice for the best dual shower head, but any of the options we provided in this guide are solid choices for your new bathroom upgrade.